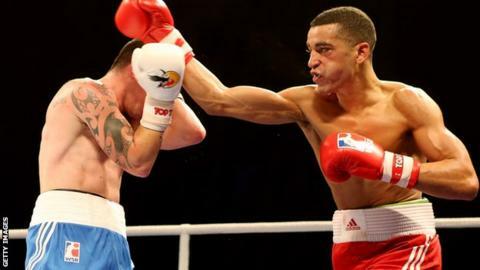 British Lionhearts suffered a narrow 3-2 defeat by Ukraine in their final World Series of Boxing group match at York Hall in east London. Lightweight Sam Maxwell was outpointed by double Olympic champion Vasyl Lomachenko and Joe Joyce lost to world heavyweight champion Oleksandr Usyk. Olympic silver medallist Fred Evans was also defeated but there were wins for Andrew Selby and Joe Ward. GB have already qualified for the quarter-finals where they face Mexico. Maxwell bravely took his fight to the formidable Lomachenko, who has lost just once in 300 fights, frustrating the Ukrainian until the latter's greater experience began to tell over the closing stages. "There is no doubt Lomachenko is the best amateur boxer in the world and he proved that again in there tonight," Maxwell reflected. "But I wasn't a million miles away and that will give me a lot of confidence." Joyce also gave a spirited display against a vastly more experienced opponent, soaking up a barrage of left-hands and managing to land his own punches up until the end of the fight. Earlier in the evening, Evans was stopped after 37 seconds of the third round in his bout with Dmytro Mytrofanov before Selby and Ward put Britain ahead with their respective points victories.